(CNN) -- The battered economy is devastating school districts nationwide. Faced with shrinking budgets, many schools say they have no choice but to lay off teachers, cut arts and sports programs or consider other drastic measures to save money. 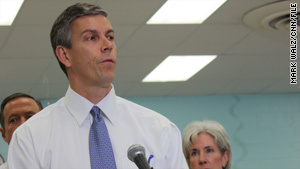 CNN's Soledad O'Brien talked with the top school official in the nation, U.S. Secretary of Education Arne Duncan, about the ties between the economy and schools, the state of education and options for the classroom. Soledad O'Brien: You often say, "We have to educate our way to a better economy." What does that mean? Arne Duncan: When we have a national high school dropout rate of almost 30 percent and we're losing 1.2 million students to the street, how can we have a strong economy? Thirty years ago it was actually OK to drop out of high school. You could still support your family and own your own home. Today there are no good jobs for a high school dropout in the legal economy. None. There are almost no good jobs in the legal economy if you just have a high school diploma. Four years at a university, two-year community colleges, trade school, vocational training -- some higher education has got to be the goal for every single student. O'Brien: How can you make change in schools when we're talking about deep budget cuts because of the terrible economy? Duncan: This is an educational emergency. We can't go to four-day school weeks. We need more time, not less, in school. We want a very significant education jobs package to stave off this potential crisis we're looking at for 2010. We're working very hard with Congress to support an emergency jobs bill to save educators' jobs. O'Brien: And if it doesn't pass, what happens? Duncan: Children get hurt. When you eliminate summer school -- that's a particular challenge especially for at-risk students. When you eliminate extracurriculars -- band, art, sports teams -- that's a huge challenge, that's the reason a lot of kids go to school. We don't want to take a step backward. Teachers are our unsung heroes. They're doing extraordinary work. We have to do everything we can to support them. I just have so much respect for President Obama's courage at a time when he basically level-funded domestic spending, [but] for education he's asking for historic increases. Why? Because this is an investment that -- if we fail to make it -- we do so at great peril. O'Brien: Speaking generally, is education a mess? Duncan: We have a diversity of outcomes. Our best schools are some of the best in the world. Schools in the middle are improving. Then there are the underperforming schools -- they're in every state. That bottom 5 percent, where the dropout rates are 50, 60, 70 percent -- that's where we have a moral obligation to step in with a huge sense of urgency and get dramatically better results. Poverty is not destiny and anyone who tells you that is lying. We know poor children can learn. O'Brien: You have said in the past you have to do something dramatic. Close a school, is that dramatic? Duncan: There are many different options. That's always going to be determined at the local level. But incremental change is not the solution. Where you have schools that, frankly for decades, haven't given those children the education of quality they need, the status quo isn't the answer. We have to think about something that's going to help students today, not 10 years from now. Our students have one chance to get a good education. O'Brien: In Chicago you closed schools when you ran the district. There was an upside and a downside. Let's talk about the upside first. Duncan: The upside: In Chicago, we turned around Sherman Elementary about four years ago. There you have the same children, same poverty, same families, and unfortunately, the same violence in that community. In three to four short years the number of students meeting or exceeding state test standards has more than doubled. Why? We had an absolute passionate belief that these students can be very, very successful. Is it hard work? Absolutely. Does it take remarkable educators? Absolutely. Does it take going way beyond the call of duty? Absolutely. But it is also absolutely possible. O'Brien: Describe for me what was done at Sherman. Duncan: We moved the adults out, the children stayed, and we came in with another phenomenal group of adults -- a new principal, teachers and staff. Sherman parents were initially very worried. I think that's in part because parents in disadvantaged communities have been lied to by authorities several times before. It's hard for them to trust change. These were parents who were very, very angry at me personally. Now, when I walk in that community, those same parents will literally kiss me on the cheek. They see that we did the right thing by their children. It doesn't matter -- rich, poor, black, white -- every parent in every community wants the best for their children. When you simply keep your word, no one appreciates that more than a parent whose child has not had a chance to break through. I'll tell you another interesting story. There used to be huge levels of violence in that school. In that first year of turnaround, violence went down so much that unbeknownst to me, my security team audited the results. They thought it couldn't have gotten that much safer, but that's exactly what happened. The culture fundamentally changed. O'Brien: You got some flack when research came out that said the kids in a school closing were sent to an equally crappy school. Duncan: When you go from one low-performing school to a marginally better one, yes, you're not going to have any big benefit, but where you can turn around that entire school -- bring in a new team of adults you can help every single one of those students in their neighborhood school, that's instead what you ultimately want to do. This is never about pointing fingers. O'Brien: But in a way it is about pointing fingers, because people say, "It's the parents -- they're not involved" or "It's the teachers." My mom was a public school teacher for a million years and she used to say "We don't get paid enough money to deal with the challenges that we have." Duncan: In education every one does love to point fingers. But we are seeing communities where folks are moving out of their silos. Where that's happening, students can do very, very well. Chicago has a long way to go but there's been real progress. Sadly, Chicago's not alone with its struggles. There isn't one urban school district in the country -- Chicago, L.A., New York, D.C., Philly, Baltimore -- there's not one urban system yet where the dropout rate is low enough and the graduation rate is high enough. There has been a lot of progress including in Chicago, but no one is satisfied. We have to get better faster.